NumPy’s universal functions (ufuncs) currently have some limited functionality for operating on user defined subclasses of ndarray using __array_prepare__ and __array_wrap__ , and there is little to no support for arbitrary objects. e.g. SciPy’s sparse matrices  . Here we propose adding a mechanism to override ufuncs based on the ufunc checking each of it’s arguments for a __array_ufunc__ method. On discovery of __array_ufunc__ the ufunc will hand off the operation to the method. The __array_ufunc__ as described below requires that any corresponding Python binary operations (__mul__ et al.) should be implemented in a specific way and be compatible with Numpy’s ndarray semantics. Objects that do not satisfy this cannot override any Numpy ufuncs. We do not specify a future-compatible path by which this requirement can be relaxed — any changes here require corresponding changes in 3rd party code. The current machinery for dispatching Ufuncs is generally agreed to be insufficient. There have been lengthy discussions and other proposed solutions , . Using ufuncs with subclasses of ndarray is limited to __array_prepare__ and __array_wrap__ to prepare the output arguments, but these don’t allow you to for example change the shape or the data of the arguments. Trying to ufunc things that don’t subclass ndarray is even more difficult, as the input arguments tend to be cast to object arrays, which ends up producing surprising results. In : np.multiply(a, bsp) # Returns NotImplemented to user, bad! Here, it appears that the sparse matrix was converted to an object array scalar, which was then multiplied with all elements of the b array. However, this behavior is more confusing than useful, and having a TypeError would be preferable. This proposal will not resolve the issue with scipy.sparse matrices, which have multiplication semantics incompatible with numpy arrays. However, the aim is to enable writing other custom array types that have strictly ndarray compatible semantics. method is a string indicating how the Ufunc was called, either "__call__" to indicate it was called directly, or one of its methods: "reduce", "accumulate", "reduceat", "outer", or "at". kwargs contains any optional or keyword arguments passed to the function. This includes any out arguments, which are always contained in a tuple. Hence, the arguments are normalized: only the required input arguments (inputs) are passed on as positional arguments, all the others are passed on as a dict of keyword arguments (kwargs). In particular, if there are output arguments, positional are otherwise, that are not None, they are passed on as a tuple in the out keyword argument (even for the reduce, accumulate, and reduceat methods where in all current cases only a single output makes sense). If one of the input or output arguments implements __array_ufunc__, it is executed instead of the ufunc. If more than one of the arguments implements __array_ufunc__, they are tried in the following order: subclasses before superclasses, inputs before outputs, otherwise left to right. The first __array_ufunc__ method returning something else than NotImplemented determines the return value of the Ufunc. If all __array_ufunc__ methods of the input arguments return NotImplemented, a TypeError is raised. If a __array_ufunc__ method raises an error, the error is propagated immediately. If none of the input arguments had an __array_ufunc__ method, the execution falls back on the default ufunc behaviour. In the above, there is one proviso: if a class has an __array_ufunc__ attribute but it is identical to ndarray.__array_ufunc__, the attribute is ignored. This happens for instances of ndarray and for ndarray subclasses that did not override their inherited __array_ufunc__ implementation. The Python operator override mechanism gives much freedom in how to write the override methods, and it requires some discipline in order to achieve predictable results. Here, we discuss an approach for understanding some of the implications, which can provide input in the design. It is useful to maintain a clear idea of what types can be “upcast” to others, possibly indirectly (e.g. indirect A->B->C is implemented but direct A->C not). If the implementations of __array_ufunc__ follow a coherent type casting hierarchy, it can be used to understand results of operations. For each __array_ufunc__ method, draw directed edges from each possible input type to each possible output type. If the resulting graph is acyclic, it defines a coherent type casting hierarchy (unambiguous partial ordering between types). In this case, operations involving multiple types generally predictably produce result of the “highest” type, or raise a TypeError. See examples at the end of this section. If the graph has cycles, the __array_ufunc__ type casting is not well-defined, and things such as type(multiply(a, b)) != type(multiply(b, a)) or type(add(a, add(b, c))) != type(add(add(a, b), c)) are not excluded (and then probably always possible). Above A: the types that A can be (indirectly) upcast to in ufuncs. Below A: the types that can be (indirectly) upcast to A in ufuncs. Incompatible: neither above nor below A; types for which no (indirect) upcasting is possible. Note that the legacy behaviour of numpy ufuncs is to try to convert unknown objects to ndarray via np.asarray. This is equivalent to placing ndarray above these objects in the graph. Since we above defined ndarray to return NotImplemented for classes with custom __array_ufunc__, this puts ndarray below such classes in the type hierarchy, allowing the operations to be overridden. In view of the above, binary ufuncs describing transitive operations should aim to define a well-defined casting hierarchy. This is likely also a sensible approach to all ufuncs — exceptions to this should consider carefully if any surprising behavior results. 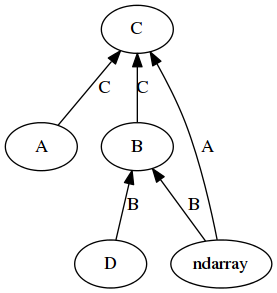 The __array_ufunc__ of type A can handle ndarrays returning C, B can handle ndarray and D returning B, and C can handle A and B returning C, but not ndarrays or D. The result is a directed acyclic graph, and defines a type casting hierarchy, with relations C > A, C > ndarray, C > B > ndarray, C > B > D. The type A is incompatible with B, D, ndarray, and D is incompatible with A and ndarray. Ufunc expressions involving these classes should produce results of the highest type involved or raise a TypeError. One-cycle in the __array_ufunc__ graph. In this case, the __array_ufunc__ relations have a cycle of length 1, and a type casting hierarchy does not exist. Binary operations are not commutative: type(a + b) is A but type(b + a) is B. Longer cycle in the __array_ufunc__ graph. In this case, the __array_ufunc__ relations have a longer cycle, and a type casting hierarchy does not exist. Binary operations are still commutative, but type transitivity is lost: type(a + (b + c)) is A but type((a + b) + c) is C.
Generally, it is desirable to mirror the class hierarchy in the ufunc type casting hierarchy. The recommendation is that an __array_ufunc__ implementation of a class should generally return NotImplemented unless the inputs are instances of the same class or superclasses. This guarantees that in the type casting hierarchy, superclasses are below, subclasses above, and other classes are incompatible. Exceptions to this need to check they respect the implicit type casting hierarchy. Note that type casting hierarchy and class hierarchy are here defined to go the “opposite” directions. It would in principle also be consistent to have __array_ufunc__ handle also instances of subclasses. In this case, the “subclasses first” dispatch rule would ensure a relatively similar outcome. However, the behavior is then less explicitly specified. # Cannot handle items that have __array_ufunc__ (other than our own). # and then start the right iterator for the given method. # However, we do have to support legacy, so call back into the ufunc. # overrides, and it will do the coercion to array for us. Note that, as a special case, the ufunc dispatch mechanism does not call this ndarray.__array_ufunc__ method, even for ndarray subclasses if they have not overridden the default ndarray implementation. As a consequence, calling ndarray.__array_ufunc__ will not result to a nested ufunc dispatch cycle. The use of super should be particularly useful for subclasses of ndarray that only add an attribute like a unit. In their __array_ufunc__ implementation, such classes can do possible adjustment of the arguments relevant to their own class, and pass on to the superclass implementation using super until the ufunc is actually done, and then do possible adjustments of the outputs. # for simplicity, outputs are ignored here. As a specific example, consider a quantity and a masked array class which both override __array_ufunc__, with specific instances q and ma, where the latter contains a regular array. Executing np.multiply(q, ma), the ufunc will first dispatch to q.__array_ufunc__, which returns NotImplemented (since the quantity class turns itself into an array and calls super, which passes on to ndarray.__array_ufunc__, which sees the override on ma). Next, ma.__array_ufunc__ gets a chance. It does not know quantity, and if it were to just return NotImplemented as well, an TypeError would result. But in our sample implementation, it uses getattr(ufunc, method) to, effectively, evaluate np.multiply(q, ma.data). This again will pass to q.__array_ufunc__, but this time, since ma.data is a regular array, it will return a result that is also a quantity. Since this is a subclass of ndarray, ma.__array_ufunc__ can turn this into a masked array and thus return a result (obviously, if it was not a array subclass, it could still return NotImplemented). Note that in the context of the type hierarchy discussed above this is a somewhat tricky example, since MaskedArray has a strange position: it is above all subclasses of ndarray, in that it can cast them to its own type, but it does not itself know how to interact with them in ufuncs. For some classes, Ufuncs make no sense, and, like for some other special methods such as __hash__ and __iter__ , one can indicate Ufuncs are not available by setting __array_ufunc__ to None. If a Ufunc is called on any operand that sets __array_ufunc__ = None, it will unconditionally raise TypeError. In the type casting hierarchy, this makes it explicit that the type is incompatible relative to ndarray. If other.__array_ufunc__ is None, ndarray returns NotImplemented. Control reverts to Python, which in turn will try calling a corresponding reflexive method on other (e.g., other.__rmul__), if present. If the __array_ufunc__ attribute is absent on other and other.__array_priority__ > self.__array_priority__, ndarray also returns NotImplemented (and the logic proceeds as in the previous case). This ensures backwards compatibility with old versions of NumPy. Otherwise, ndarray unilaterally calls the corresponding Ufunc. Ufuncs never return NotImplemented, so reflexive methods such as other.__rmul__ cannot be used to override arithmetic with NumPy arrays if __array_ufunc__ is set to any value other than None. Instead, their behavior needs to be changed by implementing __array_ufunc__ in a fashion consistent with the corresponding Ufunc, e.g., np.multiply. See List of operators and NumPy Ufuncs for a list of affected operators and their corresponding ufuncs. Implement __array_ufunc__ and follow Numpy semantics for Python binary operations (see below). Set __array_ufunc__ = None, and implement Python binary operations freely. In this case, ufuncs called on this argument will raise TypeError (see Turning Ufuncs off). Here, in the first and second example, mine.__mul__(arr) gets called and the result arrives immediately. In the third example, first arr.__mul__(mine) is called. In option (1), the check on mine.__array_ufunc__ is None will succeed and thus NotImplemented is returned, which causes mine.__rmul__(arg) to be executed. In option (2), it is presumably inside arr.__array_ufunc__ that it becomes clear that the other argument cannot be dealt with, and again NotImplemented is returned, causing control to pass to mine.__rmul__. For the fourth example, with the in-place operators, we have here followed ndarray and ensure we never return NotImplemented, but rather raise a TypeError. In option (1) this happens indirectly: we pass to np.multiply, which in turn immediately raises TypeError, because one of its operands (out) disables Ufuncs. In option (2), we pass directly to arr.__array_ufunc__, which will return NotImplemented, which we catch. the reason for not allowing in-place operations to return NotImplemented is that these cannot generically be replaced by a simple reverse operation: most array operations assume the contents of the instance are changed in-place, and do not expect a new instance. Also, what would ndarr[:] *= mine imply? Assuming it means ndarr[:] = ndarr[:] * mine, as python does by default if the ndarr.__imul__ were to return NotImplemented, is likely to be wrong. Now consider what would happen if we had not added checks. For option (1), the relevant case is if we had not checked whether __array_func__ was set to None. In the third example, arr.__mul__(mine) is called, and without the check, this would go to np.multiply(arr, mine). This tries arr.__array_ufunc__, which returns NotImplemented and sees that mine.__array_ufunc__ is None, so a TypeError is raised. For option (2), the relevant example is the fourth, with arr *= mine: if we had let the NotImplemented pass, python would have replaced this with arr = mine.__rmul__(arr), which is not wanted. Because the semantics of Ufunc overrides and Python’s binary operations are nearly identical, in most cases options (1) and (2) will yield the same result with the same implementation of __array_ufunc__. One exception is the order in which implementations are tried when the second argument is a subclass of the first argument, due to a Python bug  expected to be fixed in Python 3.7. In general, we recommend adopting option (1), which is the option most similar to that used by ndarray itself. Note that option (1) is viral, in the sense that any other class that wishes to support binary operations with your class now must also follow these rules for supporting binary arithmetic with ndarray (i.e., they must either implement __array_ufunc__ or set it to None). We believe this is a good thing, because it ensures the consistency of ufuncs and arithmetic on all objects that support them. To make implementing such array-like classes easier, the mixin class NDArrayOperatorsMixin provides option (1) style overrides for all binary operators with corresponding Ufuncs. Classes that wish to implement __array_ufunc__ for compatible versions of NumPy but that also need to support binary arithmetic with NumPy arrays on older versions should ensure that __array_ufunc__ can also be used to implement all binary operations they support. Finally, we note that we had extensive discussion about whether it might make more sense to ask classes like MyObject to implement a full __array_ufunc__ . In the end, allowing classes to opt out was preferred, and the above reasoning led us to agree on a similar implementation for ndarray itself. The opt-out mechanism requires disabling Ufuncs so a class cannot define a Ufuncs to return a different result than the corresponding binary operations (i.e., if np.add(x, y) is defined, it should match x + y). Our goal was to simplify the dispatch logic for binary operations with NumPy arrays as much as possible, by making it possible to use Python’s dispatch rules or NumPy’s dispatch rules, but not some mixture of both at the same time. class :ndarray takes short cuts for __pow__ for the cases where the power equals 1 (positive), -1 (reciprocal), 2 (square), 0 (an otherwise private _ones_like ufunc), and 0.5 (sqrt), and the array is float or complex (or integer for square). Because NumPy’s matmul is not a ufunc, it is currently not possible to override numpy_array @ other with other taking precedence if other implements __array_func__. ndarray currently does a copy instead of using this ufunc. Some numpy functions could be implemented as (generalized) Ufunc, in which case it would be possible for them to be overridden by the __array_ufunc__ method. A prime candidate is matmul, which currently is not a Ufunc, but could be relatively easily be rewritten as a (set of) generalized Ufuncs. The same may happen with functions such as median, min, and argsort.